Recently, PM Modi reached Mania to attend the ASEAN Summit and the East Asia Summit along with other world leaders. As our Prime Minister is known for his unique style everywhere, this time again he donned a different look. Although he is often seen in traditional attire this time he paired his white Kurta Pyjama with a dark grey jacket. However, his attire was not the only thing that people noticed. 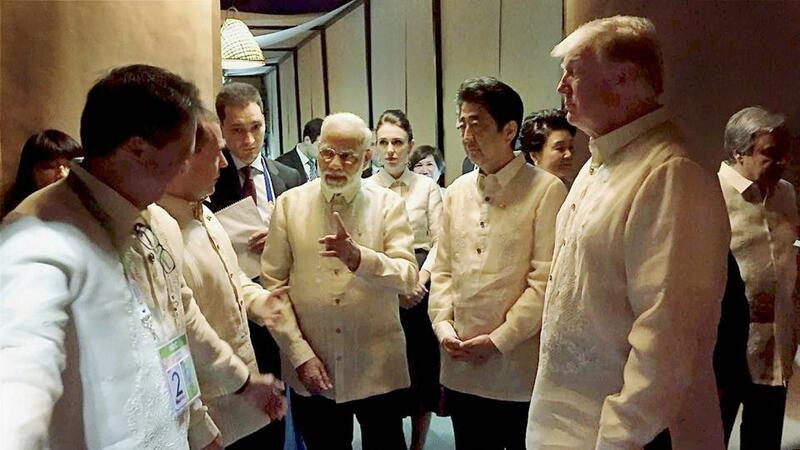 The pictures of PM Modi at the ASEAN Summit Gala dinner have gone viral with funny photo captions. In the picture, our PM can be seen meeting with leaders like Japan’s PM Shinzo Abe, US President Trump and Russian PM Dmitry Medvedev. All the leaders were wearing Barong Tagalong, a similar shirt which also happens to be the national dress of Philippines. As soon as the pictures were out, Twitter people went all out to come up with hilarious one-liners for the photos. Sattar minute hai tumhare paas.